Located 25 km southwest of Da Nang at an altitude of 1,487m, Ba Na Hills are considered as “One temperate place in the tropical forest” because the climate is cool all the year round and you can enjoy four seasons within a single day: spring in the morning, like summer by noon, autumn by the afternoon and winter in the evening! 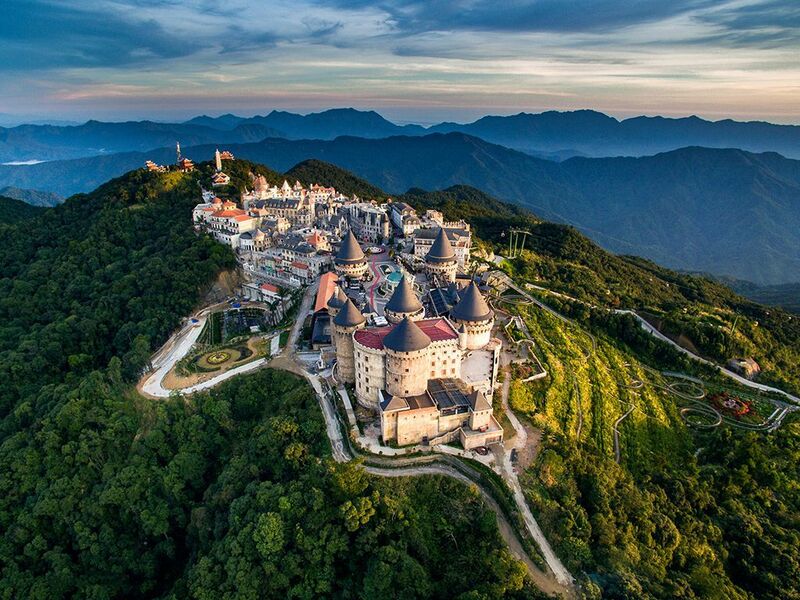 With refreshingly cool weather and gorgeous countryside views, Ba Na Hills is a real treasure of Da Nang. Unfortunately for backpackers, there is no public buses to Ba Na Hills. Either, you can get a taxi to Ba Na Hills for 600 000 VND (USD26) round trip, or you can go by signing up for a Ba Na Hills tour. Alternatively, you may rent a bike from hostel (USD5 for 24-hours) and it’s about an hour drive. However, we only recommend this option for confident riders as you may pass by bumpy roads and with big trucks. The price to enter Ba Na Hills includes the ticket for all cable cars and theme park entrance ticket. This ticket price does not include the price for Wax Museum (100,000 VND/ adult, and free for kids), as well as food and beverage. You can read more about the ticket price here. Apart from the cooling climate and its french architectures, Ba Na cable cars hold two Guinness World Records: the world’s longest single cable car system (5,042.62 m long) and the world’s highest gap between its departure and arrival station (1,291.81 m)! It was an amazing feeling on a cable car cabin floating over an ancient rainforest, hovering over boulders and waterfalls. We arrived at the D’amour Garden (or Le Jardin D’amour) at Ba Na Hills Mountain Resort. The whole area consist of 9 gardens: Love Garden, Mystery Garden, Legendary Garden, Memory Garden, Heaven Garden, Grape Garden, Thought Garden Suoi Mo Garden and Sacred Garden. It was very foggy once we were up there, and it started to drizzle. It was unfortunate for us not being able to take nice pictures. There is a Derby Wine Cellar with a constant temperature of 16 to 20 degrees Celsius for you to explore! Take a funicular up to the French Village! Here’s the part where I shall let pictures tell the story. Once it gets too cold to explore outside, there is a 3-storey amusement park to play! All rides, rock climbing, arcade games and movies are inclusive in the entrance ticket except for wax museum and carnival games. We glad that we chose to bike up ourselves instead of joining the tour because there’s no way you can explore everything within the limited time frame! We will definitely come back again in another season for better photoshoot! A day dreamer who has a passion in roaming around the world getting lost, experiencing new cultures and meeting the locals. I enjoy staying with a local home (i.e couchsurfing) and work with them (i.e workaway), or being a TEFL teacher to earn money while travelling!